The cabinet of minerals was a collection of native ores assembled in the antebellum period to illustrate their potential commercial value to the state. The original collection was completed in 1856 and displayed in the State Capitol. A second, larger cabinet, put together after the Civil War primarily for exhibition and education, played a major role in establishing a state-supported museum of natural history. The collection contained specimens large enough to show the potential for commercial mining as well as a few fossils. No inventory of the cabinet has been found, but it is believed to have included gold, coal, mica, copper, iron, tungsten, zinc, granite, marble, lead, nickel, kaolin, and limestone. 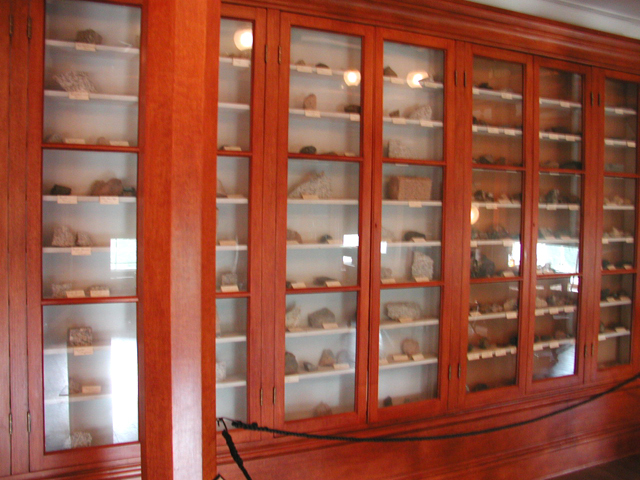 In 1865 the state donated the collection to the University of North Carolina in Chapel Hill, where other collections were added, exhibited, and culled until the original cabinet of minerals was no longer distinguishable. After the Civil War, state geologist W. C. Kerr decided to build a second cabinet from the renewed geological survey. The capitol building again became home for the exhibit, but the display area was hampered by boxes of materials stored by the military department. By 1877 the new cabinet of minerals had become larger in both scope and size than its predecessor. Leonidas L. Polk, commissioner of the North Carolina Department of Agriculture, conceived the idea of a museum of natural history in 1879, and the legislature transferred jurisdiction of the mineral collection to his agency. It was removed from the capitol and became part of a larger collection that frequently was broken apart for various exhibits over the next two years. By 1881 the second cabinet had suffered the same fate as the first; no longer could its parts be separated and identified. It had been swallowed by what was to become the State Museum and later the Museum of Natural Sciences. Stuart Noblin, "Leonidas Lafayette Polk and the North Carolina Department of Agriculture," NCHR 20 (April-July 1943). State Board of Agriculture, North Carolina and Its Resources (1896). Conrad, T.A. "Appendix A: Descriptions of New Genera and Species of Fossil Shells of North Carolina in the State Cabinet at Raleigh," of Report of the Geological Survey of North Carolina. Raleigh, N.C.: Josiah Turner. 1875. http://archive.org/stream/reportgeologica00kerrgoog#page/n350/mode/2up.